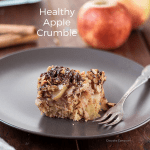 This healthy apple crumble with oats recipe can be prepared all year round, but I think it can easily be added to the list of best Fall recipes. It can be enjoyed as a warm breakfast, snack or even as a dessert. It’s sweetened with just a little bit of honey and you simply need the right oatmeal to prepare a gluten-free version. It’s a great recipe to be added to your Meal Plan. This recipe requires that you prepare the base, filling and the crumble separately, but you don’t need any special cooking skills to make it. I got the inspiration for this apple crumble after seeing a recipe in Danielle’s blog, I Only Came For The Cake. The one that got my attention was the blackberry crumble bars, but since it’s not blackberry season at the moment, I’ve decided to go with apples. The pan that I’ve used for this recipe measures 13×19 cm (5×7 inches), but if you have one that is a little bigger, it will also be fine. 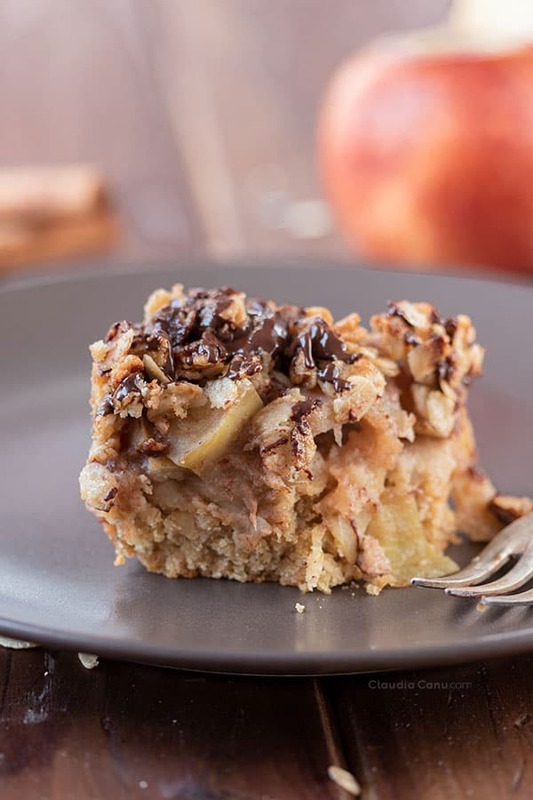 The only change would be that each layer is thinner and, as a result, you would get apple crumble bars that you could eat simply with the help of two fingers, exactly like in Danielle’s recipe. I am a super fan of oats and it is a staple food that is never missing in my house. In my post Healthy Oatmeal Cookies, I tell you in detail the reasons why oats are beneficial for health. 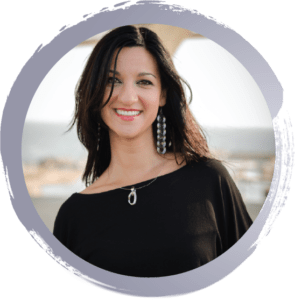 The apple is a fruit of low glycemic index, which means that when we eat it, we don’t have a spike in blood sugar, which makes us go hungry shortly after eating. In addition, as well as oats, apples contain fiber and it has been shown that the skins contain a big number of antioxidants. That’s why my advice would be to buy organic or locally produced apples, so that you can eat the skin, knowing that it doesn’t have any pesticides or wax on it. 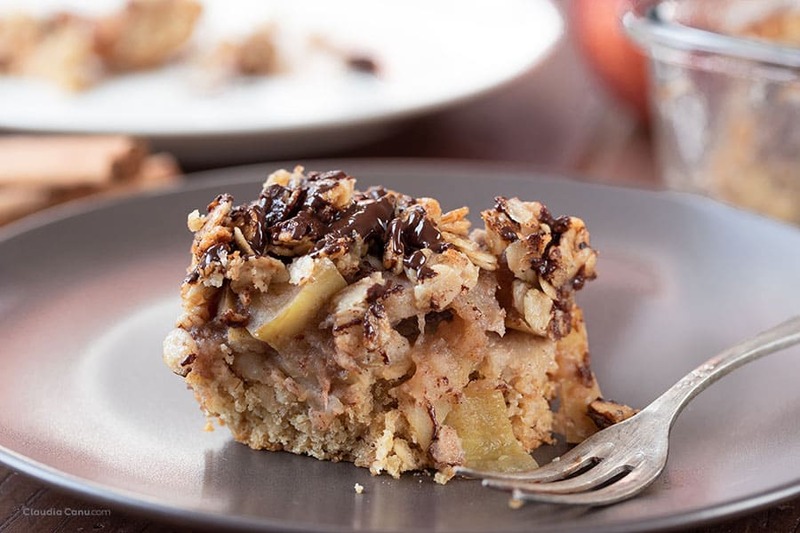 Is it inexpensive to prepare this healthy apple crumble? 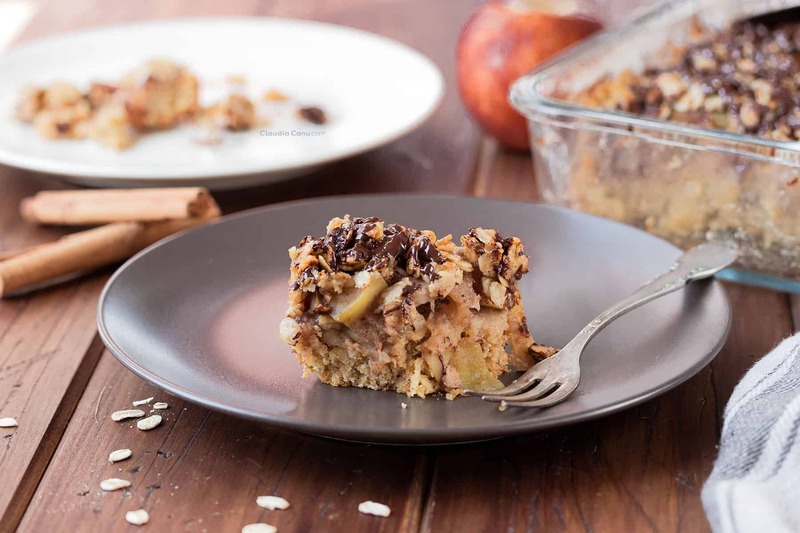 The base ingredients present in larger quantities in this recipe are apples and oats and those are usually not expensive, even if you buy them organic. Plus, this recipe doesn’t require any lesser-known ingredients making it very likely that you already have all of the ingredients in your pantry. Although apples are an Autumn/Winter fruit, it’s also true that we can buy them all year round. 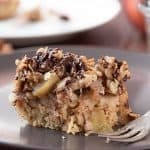 As it’s also easy to find all of the other ingredients needed for the recipe, I’d say that this healthy apple crumble can be prepared any day of the year. However, as I said above, I get the feeling that the apple and cinnamon combination, and the fact that it’s a breakfast/snack/dessert food that can be enjoyed fresh out of the oven, makes me think of a healthy Fall recipe instead. If you enjoy a warm breakfast, for example, this apple crumble can be heated in the microwave for a couple of minutes and is ideal for the colder days. Let’s just say it, this healthy crumble can be eaten for any occasion, whether for breakfast, as a snack, for brunch or even as a dessert. 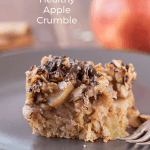 I took it to a barbecue once and it was a success, so don’t wait any longer to add this recipe to your list of healthy apple treats. Can I prepare it with other ingredients to get different flavors? I have used red apples, but you can use your favorite apples or even experiment with other types that, maybe, you don’t usually eat. Also, you can cook the apples a little less or you can bake them in the oven. Personally, I like them when they are very soft. You could also use berries instead of apples. You can use them fresh or frozen and cook them in a pot, just as I have prepared the apples in the video. Chocolate is not essential, but come on, chocolate can make everything even more delicious, right? As always, thank you very much for stopping by here. 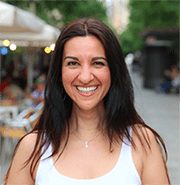 A big hug and cheers to a healthier life! Grease and flour a 13x19cm (5×7 inches) pan. In a bowl, pour the ¾ cup of oat flour**, ⅓ cup of almond flour, ⅓ cup of oats, ¼ teaspoon pure vanilla, ¼ teaspoon of baking powder and ⅛ teaspoon of salt. Mix all of these dry ingredients together. In the same bowl, add the 2 tablespoons of organic coconut oil, 2 tablespoons of raw honey, and the 2 eggs. Mix all ingredients well until they are blended together. Pour the dough into the previously greased and floured pan. With the help of a fork, make holes in the dough. Pour the apples on top with all of their juice. For the crumble, mix all of the ingredients in a bowl. Pour the crumble on top of the layer of apples. Bake for 10 minutes or until the crumble is golden brown. For the chocolate topping: Melt 4 or 5 squares of chocolate with 1 teaspoon of coconut oil. You can use the microwave or a pot. Once it’s liquid, use a teaspoon to pour it on top of the crumble. * If you use pure organic honey, it’s probably hard. In that case, use hot water to mix it. ** If you don’t have oat flour, you can simply process the oatmeal with a food processor. 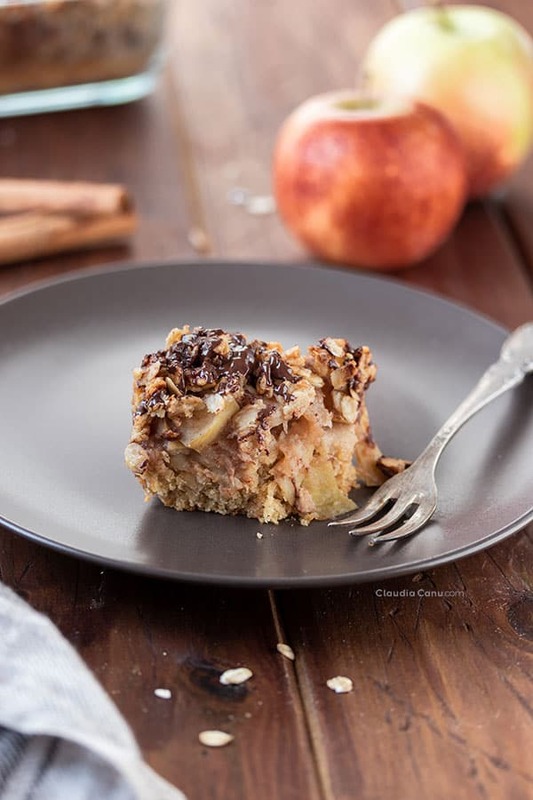 This healthy apple crumble with oats sounds delicious. Love the detailed instructions with process shots and video. I love apple desserts and I love that it’s the sort of dessert you don’t need special ingredients for! A perfect recipe to try it out this winter, so warm and cosy! Beautiful presentation. 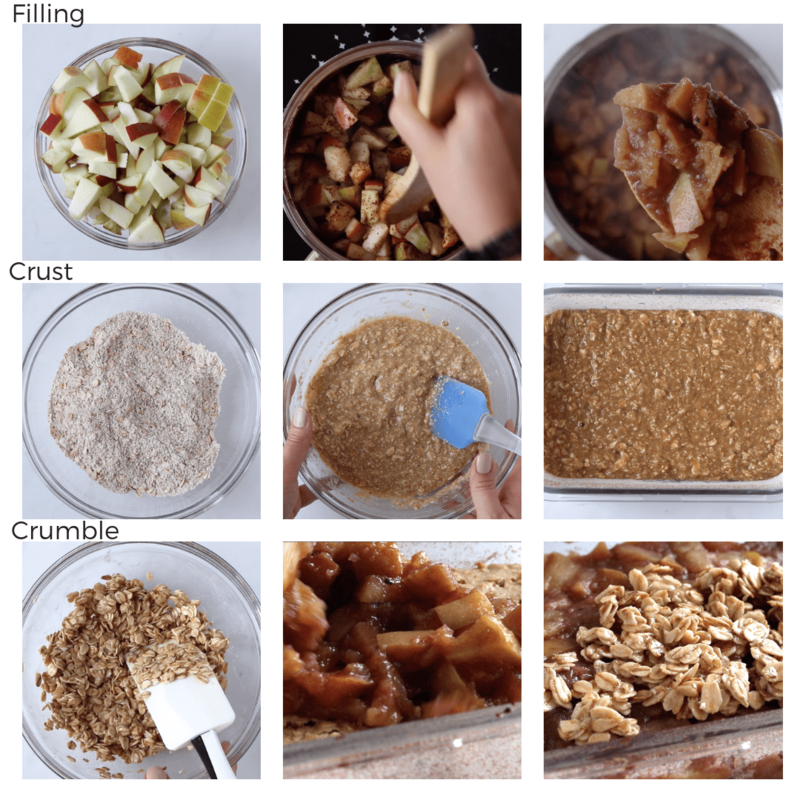 I love apple crumble, and always try to add more oats than flour. However, have never made it with a base too. Bookmarking this recipe as it looks super tempting. This sounds so delicious! I live in apple country, so we always have apples in the drawer! I am giving this a try!